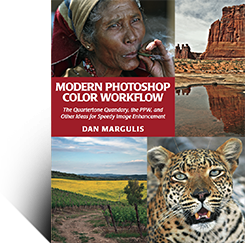 The tenth-anniversary edition of Photoshop LAB Color: The Canyon Conundrum and Other Adventures in the Most Powerful Colorspace is now available for pre-order here; the supposed publication date is 25 July. I attended the pressrun in late June, which came out well. It’s now just a matter of when the bound copies get to the warehouse. The first edition of Canyon Conundrum held up better than any of my other works, with the possible exception of Modern Photoshop Color Workflow, about which it is too early to tell. Its basics are all sound and there were not too many misconceptions. Ten years, however, is ten years. We’ve made a lot of progress in that time. When Peachpit Press approached me to do this edition, my preliminary assessment was that a third to a half of the first edition should be replaced. It wound up being close to 80 percent, and it’s a considerably longer book as well. Being completely LAB-centric, it is not intended to replace Modern Photoshop Color Workflow. There is inevitably some overlap, particularly in use of the LAB-based actions, MMM and Color Boost. Certain concepts are mentioned briefly in one book and in extended form in the other. If you already have and like the first edition then the second should be worth it for you. If you are considering the new CC book vs. MPCW, here is a summary of how they differ. I would summarize that if you are unfamiliar with what LAB can do you will get more immediate gratification out of CC. Also, if you are a top expert, LAB offers some enticing possibilities. For those in the middle, MPCW shows how to grind through a lot of images with a major increase in quality. • The concept of intentionally creating too much color in order to cut back. • Blending multiple versions to create a better result than any one of them. • Using LAB to evaluate whether a color is “wrong”, even if the file itself is not in LAB. • The uses for and options within the MMM action. • Strong coverage of Blend If (which usually is executed in LAB). • Walkthrough, time and again, of the entire workflow. • How humans perceive color. • Uses and misuses of a gray card. • Thorough coverage of the PPW panel. • Long discussions of sun-shade and similar situations where the image is divided into two parts by the lighting. • Explanation of the inner workings of the MMM action. • The H-K action to selectively darken neutrals. • Portrait considerations: when is contrast needed? • The Bigger Hammer action in detail. • Multiplication through layer masks, including treatment of false profiles. • The choice of channel to use as a base for a mask. • Camera Raw/Lightroom considered in the context of a workflow. • The sharpening action deconstructed. • The basic LAB curve form and how to vary it. • The concept of simultaneous contrast and its ramifications. • Thorough explanation of LAB’s structure, including channel-identification quizzes. • When changing the original hue is acceptable to the viewer. • Elimination of casts using LAB. • Thorough discussion of sharpening, including half a chapter on LAB’s relationship to Neo- Impressionist art, rated by the beta readers as the most stimulating chapter in the book. • Uses of LAB in forensic imaging. • How to use LAB to make selections and masks. • Using LAB to impart warmth to an image. • Half a chapter on how RGB and LAB achieve different results in Color and Luminosity modes. • A complete chapter written by the beta readers, describing how they themselves use LAB. • How to change color of a product (e.g. turn a green product red). • Uses of imaginary colors in retouching. • LAB’s overall advantage in retouching. • How to colorize a B/W photo (i.e. make it look as if originally shot in color). • An entirely new chapter on LAB noise reduction. • A chapter on editing video in Photoshop. • LAB as an interchange standard in color management. • Using the A and B as blend sources. • Portrait considerations: can there be a recipe? I just received the 1st edition of the book with a broken CD. Is there any way to download the files so that I can follow along? Unfortunately no. The second edition has a download area (no bound-in CD) but the first edition did not. It is amazing to think that 11 years ago, when the first edition came out, we could not count on users having a serious enough connection to be able to download half a gigabyte. It sure is fun (and confusing) playing with LAB color. I wish my eyes would decide what they want to see! Peachpit Press just sent me a link to a zip file with all the files in it! I’m impressed! Dear Marglis, I found skin often become terrible, and hard to be correct after several adjustments in LAB. I always resort to tools such as selective color, Hue/saturation. Is there something l should pay attention to when dealing with portrait ? And in many cases, the skin value in CMYK you recommended looks strange or even can hardly be achieved . “Terrible and hard to correct” is not a specific enough description of a problem for me to be able to comment on it. The face usually tend to be too red or yellow while other part of picture seems normal. And sometimes some area of face appear too yellow with other area looks normal. LAB, like Camera Raw, Photo-Paint, a camera, or any other object or software that manipulates digital images, is capable of producing *bad* images if misused. Without specific information as to what you did, I cannot guess which of the thousands of possibilities caused this result. Hello, out of fascination and interest I just bought your second edition. I know nothing about lab. Since you have invested in the book, I assume you will read it, after which time you will know better than I do whether you have made a mistake. Some of the the material is admittedly quite difficult, but the first halves of the first seven chapters are aimed at people who are not expert in Photoshop, let alone LAB. So, lack of experience with LAB should not be an issue. I just noticed CC2E. (Glad it’s not the year 2027.) I own and have worn out MPCW, but never owned or read CC1E. Thank for the above comparison. Just bought CC2. I have been working my way through the first five chapters of Modern Color Workflow. It is terrific stuff and I am getting a lot out of it. My question today is about another of your books, Professional Photoshop, 5th edition. Are the two books complementary to each other or is MCW in effect an update of the earlier book? To be more direct, I have limited funds and cannot figure out whether it would be beneficial to purchase the earlier book after I have exhausted MCW (or after it has exhausted me!). Bill, I don’t think there is any hurry for this decision, because MPCW does get harder as you go deeper into it. It is not intended as a replacement for PP5E, and none of the content is duplicated, but PP5E is now more than a decade old. You might find it of interest to see how the ideas have developed since then. I would think, though, that Photoshop LAB Color 2E (2015 edition) might be a more practical choice *unless* you happen to want to work in CMYK, in which case PP5E is still the way to go. Can a step by step video be made explaining the creation of the Hk effect and making a eratsz black from the RGB channels. Gene, the H-K action is the topic of Chapter 13 of Modern Photoshop Color Workflow. There is also a 14-page PDF documenting what it does. To access it, within the PPW Panel choose Help. A new dialog opens that lets you access the documentation for H-K or any other action. The H-K action has two functions, you can use either, both, or none. First, it makes neutral or near-neutral things darker, which often is useful aesthetically. Second, it poisons color, but near-neutrals more than purer ones. This is useful when the image features some bright things, but objects of lesser importance are competing with them. After running this part of H-K you can run Color Boost to restore the pure colors, and the more neutral ones won’t come back because the action will have made them much grayer. Are there any other actions/scripts in PPW4 that reduce color saturation prior to applying the CB/MMM script ? Hi! I recommended your Modern Photoshop Color Workflowbook to my friend and he says he cannot find it for sale online…except for Amazon where it is over $300 USD. Hey, it’s a great book but WTheck? @P.H. Lasky, the Skin Desaturation action aims at trying to avoid beet-red fleshtones when CB/MMM is applied. We generally have a much higher tolerance for “unrealistically” pure colors in things other than fleshtones. @Bill, Amazon had a run on copies of the book and temporarily was out of stock, leaving only the second-hand vendors who wanted $300. The situation is now rectified and the book can be purchased at the normal price of $75, new, not used. The Tone mapping is mostly on a single clicked image using the PPW steps not using any Plugins but just the simple above techniques like in PPW. You would have to define what you mean by “tone mapping” and by “local contrast adjustments”. They mean different things to different people, but by the most common definitions they are already included in step 2 of the PPW. Yippee! Lab 2nd edition – just ordered it from Amazon. Can’t wait. The first edition was just great. Hi Dan, I bought your book, hoping to be able to access the videos, sadly, I can’t access them, don’t know why – do I need a code or something? Also, today I installed the latest Photoshop (2015.5) & find that the PPW panel no longer fully works ! Is a reinstall required ? The videos are accessible here although you do have to register. Photoshop 2015.5 is the fourth consecutive “upgrade” that has broken many important plugins, including ours. There already is a workaround way to get it to work but we expect a new installer shortly. Check out the up-to-date details here. Wait. For several months now – seems like years – the alt click option with the Bigger Hammer, MMM + CB and Sharpen 2015 have not worked for me, despite reinstalls, etc. What’s more, when I alt clicked these buttons, PS 2015 and 2014 froze so badly I had to open another app to force quit it. (Giuliana has follow-up faithfully with me about this, btw.) I’m on a Mac. With the birth of 2015.5, this issue disappeared – no doubt because of Giuliana’s influence over Adobe. Not only has the issue disappeared, the panel has never worked better or more efficiently. Thanks for the response, Dan. I’l wait for the new installer. However I can’t see where I register to allow access to the videos, on the page link you mentioned. Jeff, Sorry to take so long to reply, I have checked with several users and found that there is no longer any block or registration required to view the videos. Flash, however, must be active. I purchased the book via Amazon Kindle, but later found that the exercise files are not available for Kindle edition. Can you please provide a link for those exercise files, so the learning is more cohesive, rather than finding suitable images for practice. I work in the field of gravure packaging prepress (the work is more CMYK + special colour centric), hence I also ordered the hard copies of Professional Photoshop 5th & 6th edition plus MakeReady: A PrePress Resource, as those are more prepress and CMYK centric, and most of the content is revised and updated between versions. I am sure they will help me a longway in the evergreen field of packaging printing. MP, first I am very happy that you are getting something out of PP5E. Having to read the book several times is not unusual. We have made the exercise files available online, but due to their size, there are three separate links; if you need every chapter then you must download all three. Max, My wife does not agree with your evaluation. That aside, I have no current plans for more videos, sorry. Thank-you very much for making exercise files available online for Professional Photoshop (5th Edition). Are there any plans to release the latest book on colour corection: ‘Modern Photoshop Color Workflow’ on Kindle platform ? MP, we are not going to release an electronic version of MPCW. Unless I misunderstood what you wrote (which has often happened in both the 2005 and the 2015 editions) I have a bone to pick with you about the first paragraph of the explanation on page 392. What do you mean by the statement: “In fact, it can’t be blue at all.”? If you are speaking of flowers in general this is an absurd statement. Many flowers are blue. If, on the other hand, you mean that by the process of deductive elimination based upon the pictures found on page 387, then I would AGREE with you that these channel pictures do not permit blue flowers because of 17.6C. But both Green flowers and Blue flowers do exist in nature. How I solved the Quiz. But I thought that it was unlikely that you had chosen green flowers. Therefore I chose 17.6A as being negative A. It would have been amusing if you had used Green flowers but I do not think that you would have found it easy to produce a channel similar to 17.6A with a plant which has green flowers. The leaves needed to have a B positive component which caused me to deduce that 17.6C had to be the B positive component. Both of your examples rely on selective deletions that change the meaning of what I wrote. This nowhere states that flowers can never be blue. It states that bright yellow flowers can never be blue. I am glad that you were able to solve the quizzes nevertheless, that’s the important part! I installed PPW 4.1.1 on 2 machines running CC 2017. On my Mac Book Pro 2012 it works fine. On my 2013 iMac when i use any Hammer an error arises: “Exception: typeError: Undefined is not an object”. AhHa! I reinstalled PS I meant to remove PPW first but didn’t. I kept my preferences. After the reinstallation everything works! Bruce, Thanks for the post, I’m glad you’re enjoying the books. The resources for the second edition of Photoshop LAB Color reside on the publisher’s site. The procedure for downloading them is detailed in the book in a box called “Support Materials” on Page 5. Good luck with the continued learning! Is there no way to purchase the second edition of Photoshop Lab Color? I own the first edition and I would love to purchase the second edition. Not, unfortunately, unless you are willing to pay an extortionate price to a third-party vendor. The book has gone out of print and the publisher is no longer emphasizing print titles. Dean, I wonder how many people nowadays are familiar with the quaint terms “film” and “drum scanner”. Certainly not enough to justify much documentation about how to do it, let alone if the topic is limited to black and white, let alone something of book length. When the Tango was in its prime there was a good case to be made for creating the best possible scan. Nowadays, Photoshop is easier and more capable, unless the scan is so poor as to pre-empt certain moves. For example it’s easy enough to get color so bad that it can’t be fixed. But this is not a worry for you since you are scanning B/W. In that case in principle all you need to do is avoid blowing out highlights and/or plugging shadows. Also, if the original happens to have rich detail in the deep shadows, a drum scanner can be programmed to emphasize it with superior results to what you’d get in Photoshop. Other than that, though, while I certainly would expect a generally higher-quality scan, I wouldn’t worry too much about achieving perfection on the drum. But good luck with it!